Coming in September 2014 to A Passion for Living is new collection of beautiful jewelry called Kameleon. The collection from Kameleon is called JewelPops. It will be available in all three of our locations in Oakville, Burlington, & Ancaster. The JewelPop collection is the perfect ladies accessory to add into your wardrobe. 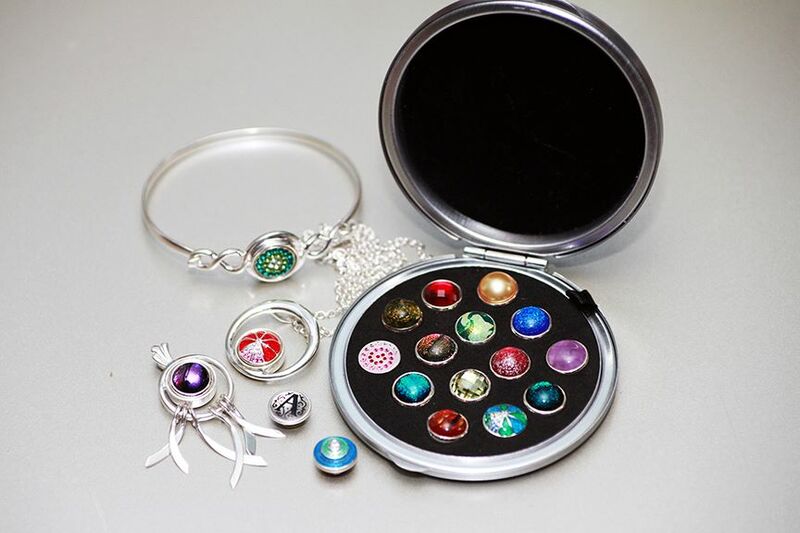 JewelPops are the small interchangeable inserts that can be popped in and out of the Kameleon Jewelry designs. The JewelPops come in a rainbow of colors and materials. Some are set with semi-precious stones, Swarovski Crystal, synthetic opals or sparkling cubics and sport outrageous names like ‘Mochalicious’ (Brown Mabe Shell) and ‘Midnight at the Oasis’ (Blue Sunstone), adding a real element of fun to the Collection. JewelPop is proudly created and designed in Canada. This patented sterling silver jewelry system allows the wearer to change the look of their jewelry with just a simple “Pop” of one of our interchangeable JewelPop inserts. With over 400 Jewelpops available, there is always something to please any fashionista from sparkling Swarovski Crystals to natural stones and colorful enamels. Each JewelPop fits seamlessly into any of the over 100 base designs available in rings, pendants, bracelets, pins, earrings, watches, belt buckles and sunglasses. Changing a JewelPop insert is a simple and elegant process. Simply apply a little pressure while pushing down on the insert with your finger. You will hear a reassuring pop or click indicating the JewelPop is in position and secure. To remove and replace with a different insert merely push from behind with your finger or use the small plastic JewelCap that comes with each jewelry design and the JewelPop will pop out. It’s that easy, very secure and no special tools are needed. A Passion for Living is the place to shop when it comes to new stylish ladies fashion accessories in Burlington, Oakville or Ancaster. Our wide selection of ladies jewelry make us your destination of choice when it comes to accessorizing fabulously!